Has life become too much for you? Terror Alert Red too-much? Return to the womb too-much? Spa day! 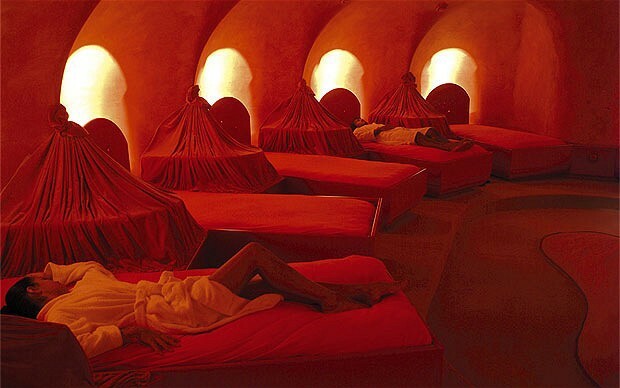 Entering the room through the neck of a uterus fashioned out of pink carpet, guests find themselves in a low-lit room, with pink carpet splashed with vermillion fabric revolving to simulate a giant umbilical cord, and are blood-coloured waterbeds designed to indicate the amniotic sac. People, I think we need to have a little talk. Buck-up, shoestraps, you’re better than this, back on the horse, etc. Or at least, in lieu of fetushood consider settling for infancy? Johnson & Johnson Baby Oil… that was some trip, that was — your mother oiling you and patting you all over with scented oil. The comforting sensation is still with you isn’t it? Get acquainted with it again: buy yourself a big bottle of baby oil, and keep it on your bathroom shelf. Thank you Stan. The sensation is with me, now. It feels a lot like my spine crawling, my gag reflex activating.